Maggie entered my life in the summer of 1995. I had just graduated from high school and was about to head off to college leaving my brother, Andrew, to fend for himself in the Evans household. Our family had been through several dogs for the sake of my brother, all eventually being given away because of their bad qualities or one of our many moves. Realizing that Andrew would be lonely as the last kid left in the home, my dad and I set out on a mission to find him a new companion. My sister, Jena, paid a visit to the animal shelter in College Station where she was in school to see if any of the dogs there seemed to be a good fit. While browsing the caged dogs, Jena saw a sweet 4-6 week old “black lab” puppy in its kennel and she felt an instant connection. She just knew that this was the dog for our family. Without question, my father and I jumped in the car to see for ourselves. Since Andrew was gone at a Tennis camp for two weeks it was the perfect window of time for us to pull it all off. I actually don’t remember whether we went to the shelter, or whether Jena had already picked the dog up. But what I still remember vividly is the drive back to San Antonio. I sat in the back seat with this sweet new puppy in my lap for the full 3 1/2 hour drive, stroking her soft puppy fur and telling her that she would be the most loved dog to ever live. In our family, dogs always had very official regal names. So we decided to name her Maggie Moon Over Brazos after the Brazos Animal Shelter where we had discovered her. For the next two weeks I acted as Maggie’s foster mom, and loved every minute of it. 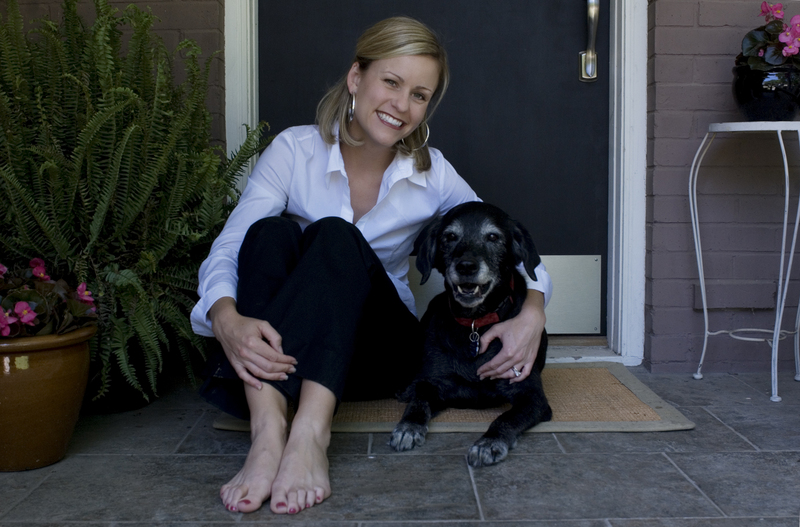 I had always been a cat person, but my time with Maggie grew a whole new affection in my heart for well-behaved dogs. And she really was exactly that, well-behaved. She peed ONCE in our house as a puppy and never did it again. She diligently did puppy training with my father and we quickly became convinced that she actually understood english because of her perfect obedience to our commands. She was so well trained that she always came when she was called and never had to be on a leash…which is still true to this day! From the moment my brother returned from tennis camp to meet his new companion, he too loved Maggie. And for his last two years of high school she was there for him through the good and the bad. However, as his freshman year of college approached we were presented with a crisis. Who would take care of Maggie? I volunteered. I had secretly believed Maggie was my dog anyway, so this would be perfect! There were often times when Andrew and I would sit at opposite sides of the room with Maggie in the middle and treats in our hands to see who she would go to…I was convinced that she came to me the majority of the time and that Maggie believed I was her mommy. Maggie and I had the BEST year together that year. 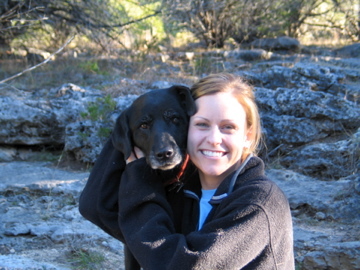 She loved joining me at TCU in Fort Worth and was always my companion when running or hanging out at the house I lived in. Everyone who encountered Maggie loved her. I realized over this year that Maggie and I had a strong bond….could it be only because of those first two weeks of her life with our family that she spent primarily with me? At the end of my junior year I signed a lease at an apartment that was not dog friendly and again we were faced with making a decision for Maggie. So she went to Jena for the next year. After that year was over I decided to stay in my apartment in Fort Worth for one more year after college, so Maggie went to Andrew who was a junior at Baylor and lived in a pet-friendly apartment. Again, Maggie enjoyed her college experience, everyone at Baylor who knew Andrew also knew Maggie….they were always together! And everyone loved Maggie. It was after this year that Maggie and I were re-united for good. I was hired by Young Life to head south to Rockport, a small town on the coast, and start-up Young Life there. I had been offered a free little home on the committee chair’s property which just happened to be right on the Gulf of Mexico. So Maggie and I packed up our things in my little red Rodeo and started our new life together on the coast. Little did I know that over the past five years God had been preparing not only my heart for ministry, but also Maggie’s to be my best friend during a hard time in my life. I am ok with people thinking I am crazy for saying that, but if you have ever had a pet by your side through a tough and lonely time in your life then you know what I mean. Rockport is lacking in the young adult department and I found myself at age 22 leaving a full and busy social life in Fort Worth in exchange for lonely nights and LOTS of free time in Rockport. Maggie was my constant companion. She was by my side at all times whether sitting at the computer working, going for a run, running errands, hanging out with kids, or going on a road trip. At the time I didn’t realize how strange it must have seemed that I never left the home without her, but to me she was the closest thing I had to “home” at that time in my life. At some point in those two years, two women involved with Young Life, actually sat me down to express their concern over some of the “lines” I seemed to often cross by bringing my dog everywhere with me. They were right, but I just couldn’t imagine not having her with me everywhere…even when entering into other’s homes! Maggie saw me through a lot in those two years. She happily looked on one Friday night when I was desperate for something to do so I just turned on some dance music and danced around my house by myself. She was also there watching me fall to pieces and cry endlessly when a relationship came to an unexpected end. She was always by my side whenever I returned home to San Antonio to my newly divorced parents. We often spent our evenings down on the end of our long pier, she would sit and smell the salt air while I would sing to the wind. And she was always up for a joyride with me and my Young Life girls. One Halloween I dressed up with some of my freshman girls and stuffed them all, Maggie included, into my Rodeo to drive the drag after a football victory. As we were driving around we were constantly yelling out the windows and honking the horn, as high school freshman in small towns (and young life leaders) do so well, and before we knew it Maggie dove under my feet out of fear….yes, while I was driving! It was a miracle that I was able to somehow pull the car over with a 65lb black lab between my legs without causing a huge accident. These memories are just a snippet of our time together in Rockport. After Rockport I was hired by Young Life in Dallas and offered a free and wonderful place to live in a backhouse. Since the family never offered for Maggie to stay with me, I assumed I needed to make alternate arrangements for her. The only problem was that no one else in my family was in a place to take her. So a good friend of mine, also named Maggie, owned a home and offered to take her until I was in a place of my own and could take her back. Its hard for me to begin to understand how I got through the next year of my life without her. I was busy acclimating to a new big city and starting a new ministry at SMU, and I often made trips to Austin to see Maggie. Every time I came through the front door, Maggie would run to me and do this low, deep whine that I had never before heard her do. She now does it almost every time I come home from a trip. After one year I was finally in my own place and Maggie and I were reunited. Potomac Ave became a place of great memories for both Maggie and I. Both my roomates, Sherri and Christi, made wonderful efforts to love Maggie and show her lots of attention. Maggie obviously loved them both. 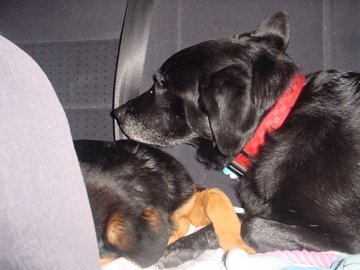 Maggie even became sisters and friends with Cally, Christi’s dog. I guess I would describe their relationship as a “love-hate” relationship. At times you thought they really loved each other, and others that they were going to rip each other’s jugulars out. But in the end, I think Maggie enjoyed Cally’s presence in the home, especially when Christi and I were both out. 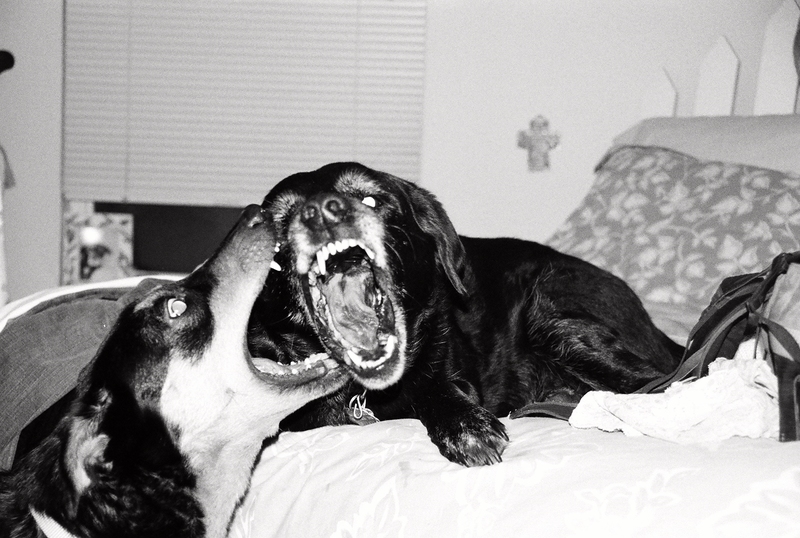 This is generally what Maggie and Cally did when they were together! even when the pads on her feet were ripped to shreds on a 100+ degree hike in the hill country of Texas and my father and I had to take turns carrying her back to the car. So when the day came that I realized she was no longer a young pup, it wasn’t surprising that Maggie refused to give up. I guess it was her hips that first indicated to me that her activity level needed to be decreased. We lived in a two story duplex and I would often see her struggling to get up the stairs. So I made a very difficult decision, which I could tell Maggie couldn’t understand, to stop taking her on runs and hikes with me. Every now and then I would let her do a small hike, but other than that, she stuck to easy walks on not so hot days. Its funny how determined she is though, I can still see it in her eyes that if I said, “Maggie, you’re hiking this fourteener with me”, she would not hesitate, even when her hips would give out she would keep trying. Maggie was the first to know that my now husband was going to propose. One night when he had come to pick me up for a date, I asked him to let Maggie out real quick to go to the bathroom while I finished getting ready. After she did her business, they were sitting on the front porch together and he decided to let her in on his secret. He told her that he had been shopping for the ring and that he would soon ask me to marry him. To this day he is convinced that Maggie understood and gave her approval….I am inclined to think the same. Maggie had observed many potential men come in and out of my life, but he was the first that I could tell she felt completely comfortable with. Sometimes when we were kissing she would nudge her head between us like we were already a little family and she wanted to be loved on, too. We enjoyed 3 amazing years with Maggie as a family. My husband loved Maggie like she was his own dog, and she would get excited and run to him when he came home. 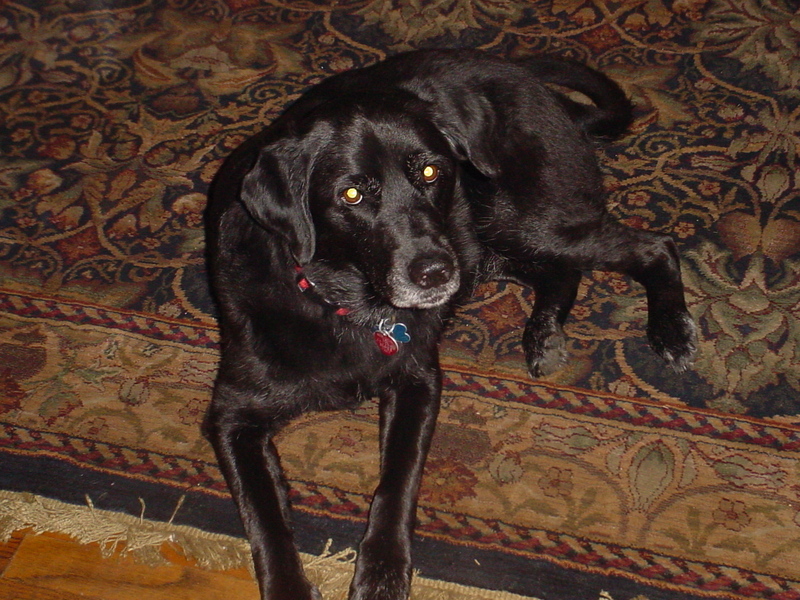 The final years of Maggie’s life were only difficult at times due to the complications of an aging body. Her vision and hearing slowly faded, her mind wasn’t as sharp, and she couldn’t actively do all that she used to. But even when struggling to walk, she maintained incredible determination and never lost her sweet personality. Even on the toughest days it was amazing to me how easy it was to be understanding and to love her in those last days. Maggie truly was the best dog I have ever known. She was a best friend and companion to me, a gift from God, I believe. She loved me unconditionally and was there by my side through the hardest and darkest times in my life. She had a joy about her that was contagious and brought a smile to my face. She was an easy dog to have, always obedient and seeking my approval. Her love for me was obvious and her desire to always be with me brought such encouragement and joy to my heart. It is hard to imagine not having her by my side for the rest of my life. But at the same time, I am more than thankful for the 16 years I had with her and for the ways God used her in my life to extend His love to me through her presence and companionship. Maggie went to heaven on February 7, 2011….and one week later God blessed us with a child! This story of sweet Maggie wants to make me cry. How precious! You are a such a great writer, I feel like I was living these stories as I read. She is a wonderful, wonderful dog and I’m so glad I’ve gotten to know her for almost 7 years. Aw, sweet Maggie! This is such a sweet story, Ash! She is easily the sweetest and calmest dog I know. I know Cally misses her, too! Sometimes for fun, Jaimeson and I will ask Cally, “Where’s Maggie?” and Cally will run around the house and yard looking, hoping that she might find Maggie! I don’t think she understands she’s a few thousand miles away! Loved reading your story about Maggie. So sweet. What a lovely story. I have to thank your dad for sending your info for me to see. 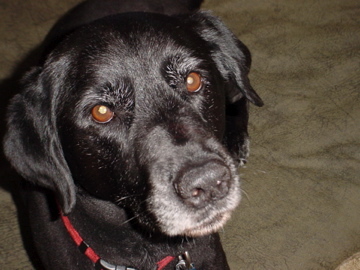 Maggie reminds me of our white lab Mindy whom we loved dearly and enjoyed her love for 18 years. I think the hip problem must be a lab thing because Mindy suffered from that at the end also. Oh, by the way, I am an old friend of your dad’s from our days in Madrid. Thank you for sharing your lovely story. I knew Jay had 3 children and it is nice to hear a bit about you all. What wonderful memories you shared with her, ones that clearly will never be forgotten. So special reading about your sweet Maggie. Thanks for sharing those stories with us.